"All new media not only double reality--they do this only fragmentarily--but also, above all, they are the doppelg�ngers of the old media. Media as doubling machines are vampires. The old media fear that the new doppelg�ngers will live on their blood, that they will be bled dry, consumed and contaminated. The new media always claim to replace the old media. But the old and the new media ought to know that whoever kills his doppelg�nger, also kills himself.[...]" 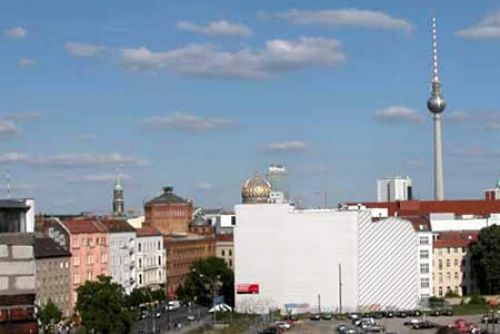 (peter weibel: „phantom painting reading reed: painting between autopsy and autoscopy, part III”) berlin is a vampire Especially if time has come to announce itself as the new capital city of art, culture or music. As no other german city berlin is supported by a not ending inflow of people and their creative shadows. The city seems to have a magnetic field that is unrestistable, and forces the inhabitants of such an oversized place to a narcism of the little varieties, as a possibility to displace themself from their city. the object Because of its altitude the mirror will not gratify the wish of an observer to see his/her own reflection. As an observer you remain as a phantom/ vampire and in terms of ralph elison also invisible to other observers. In contrast to that the city reflects itself permanently, fulfilling its (im-)proper, narcistic end in itself The project was handed to the dieselwall jury and was presented as one out of ten concepts that were priced.